Spring is inspiring. Leafing trees and swollen streams. Blossoms and bird's nests lined with fir needles. And the parade of edibles- wild and cultivated! The first lettuce, sprigs of gai lan, spicy radish, lamb's quarters and spring mushrooms. Despite this winter's heavy snowpack, western Montana's lowlands are pretty dry and crispy. It hasn't rained a lot and we've had some hot, summery days. To find the fungi, one must seek moist places. 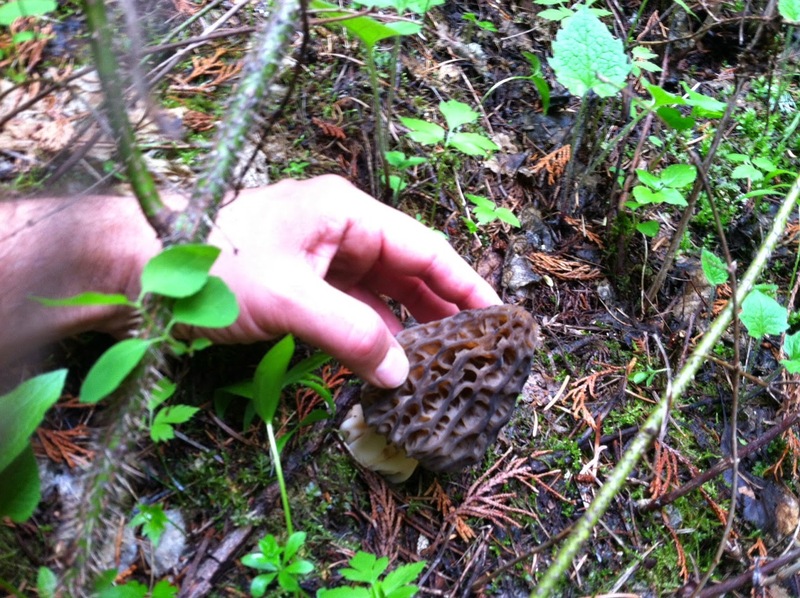 Our four-person foraging party had some luck this weekend. 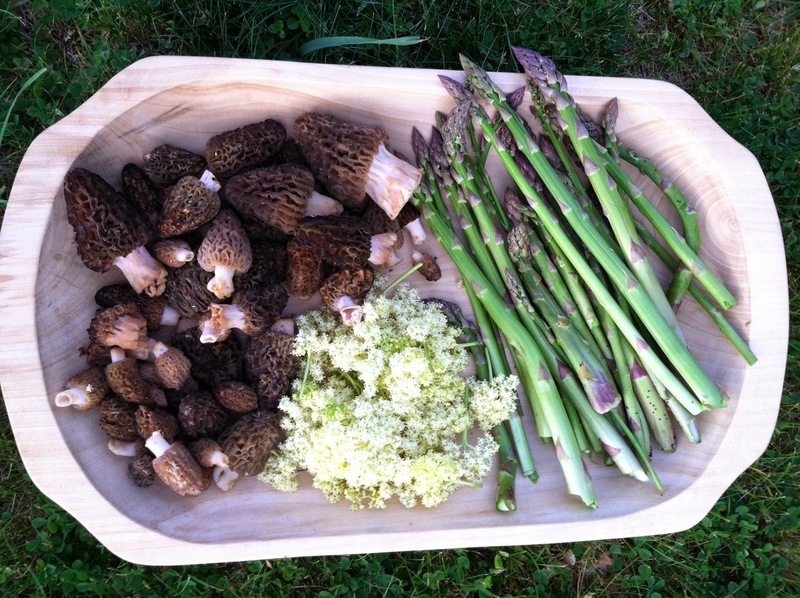 We also lucked into a large bundle of tender ditch asparagus and picked a few fistfuls of elder flowers. We stuffed the heartiest morel specimens. Mixed a log of goat cheese with yogurt, sun dried tomatoes, garlic, toasted sunflower seeds, fresh chives, sage and thyme, salt and pepper and packed it into a ziploc. Cut the corner of the bag off and injected each cap with this delicious paste. Then we rolled the mushrooms in beaten egg and breadcrumbs and fried them in butter and olive oil. The larger the mushroom, the more they contribute a fungi-flavored punch to the fritters. We found that the little guys got lost in all that butter, herbs and cheese. We breaded and fried the elder blossoms as well, which have a pleasant lemony-vegetal flavor when cooked. 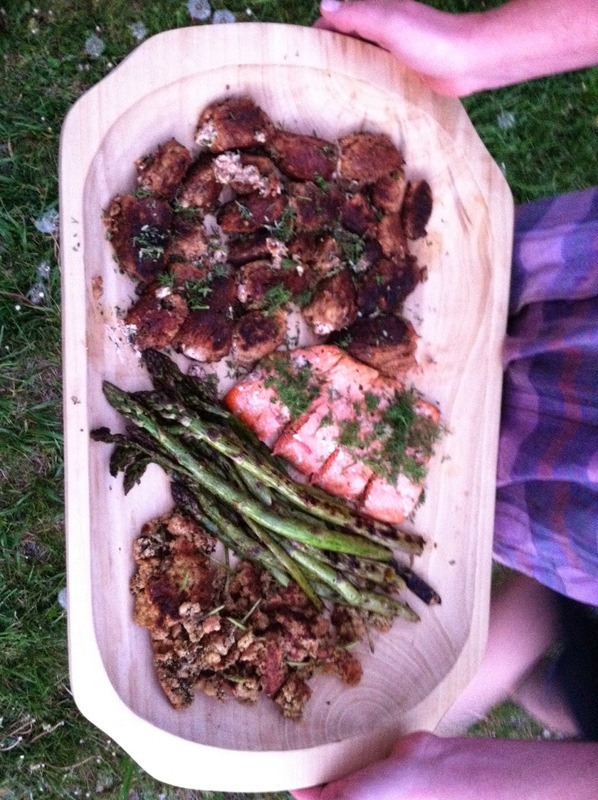 M. grilled up the asparagus and a nice slab of Alaskan salmon. We were famished. All we brought on our 5 hour forage was a stub of chorizo, a thermos of black tea and a flask of whiskey. All of that kept us going somehow, but we were ready to feast. A well-deserved feast for famished souls.